Friday! Hurrah for Friday! What better way to end the first full week of work after the holidays than with a post about painting. I've been saying for months (as in approximately 6-9 months) that I needed to paint a ton of pieces for my place. Well, I finally did it. I have been procrastinating starting this project for so long, and I'm not sure why because I really do like painting (even furniture). It's the commitment: once you start, you really do have to see it through. And the primer stage. Oil-based primer is a royally messy, if completely necessary, step. But I was invigorated by the new year and my 2014 resolutions and my desire to just get these pieces done already (since they were holding up other things). So, when the kids and I had a snow day on the first Friday back to work after the holidays, I decided that weekend would be it. And it was! The kids were playing with their new Christmas toys and before I could talk myself out of it, I threw on my painting clothes, put down a drop cloth in the playroom and got out the primer. A tip from me to you: if you're painting furniture, do it in batches. Find as many pieces as you can that you want to paint and do it all at once. It is much easier to break out the oil-based primer and paint once and just spend the time getting painty with it in one fell swoop versus doing it piecemeal. In my case, I painted 5 pieces all at one time. Two of the five things I painted were mirrors: one for my room and one for Little's room. Yay! I'll break them down by mirror. This was a clearance find from Michael's of all places. Little and I were in Michael's one afternoon searching for crafts for her to do. I happened to look in the clearance section and found this mirror on sale for $10. You can see why it was on clearance for $10, can't you? 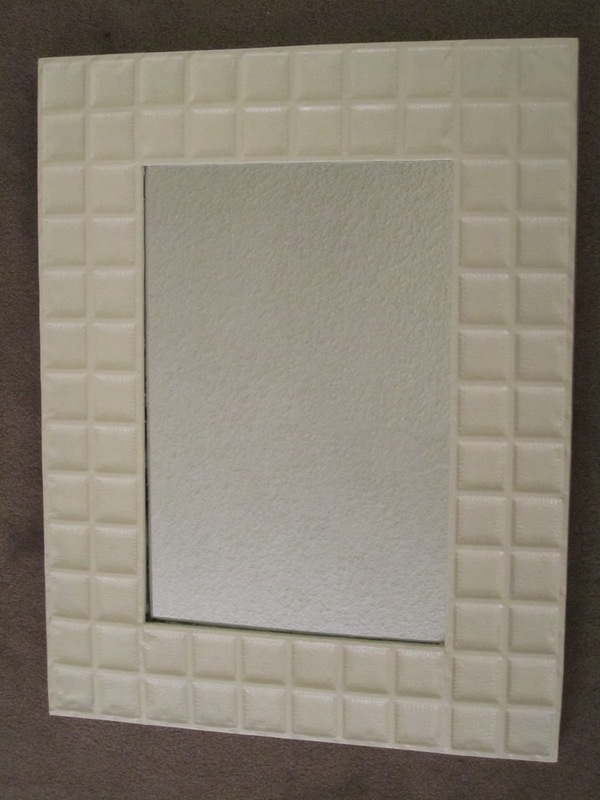 I pretty much hated the color of the finish, but the size was exactly what I needed for my room and I knew that with a few coats of white paint the mirror would be transformed to exactly what I wanted. I just followed my usual painting procedure: a coat of oil based primer (Zinsser) followed by a bunch of coats of latex. I used my favorite Dover White by Sherwin Williams and it took 2 coats. Painting all of these little squares was very time consuming and kind of annoying. I used a small brush for the primer and the first coat of white, but then used a mini roller for the second coat. Then I topped it off with a couple very light coats of Polycrilic in gloss finish - to make it shiny. 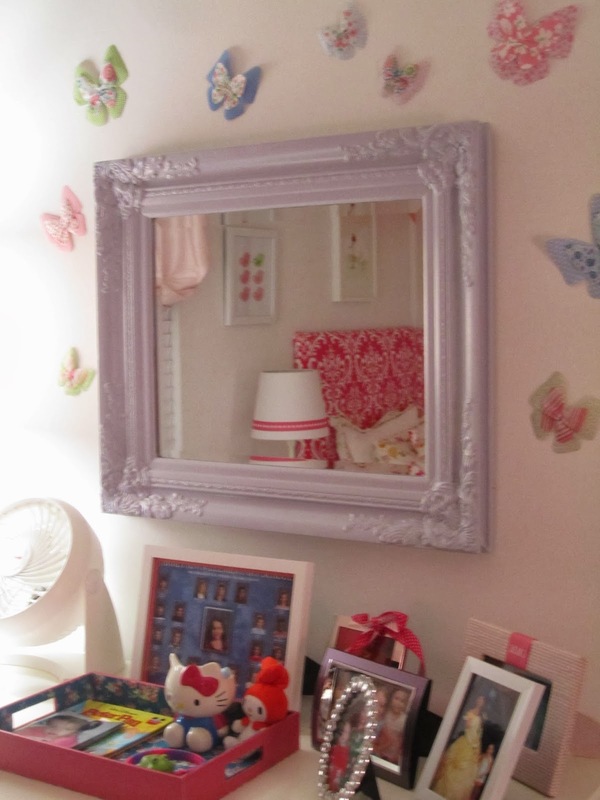 And here is the transformed mirror! Not bad for $10, right? Stay tuned for my post about where I hung it in my room. Ooh! Suspense. I bought Little's mirror last Summer from someone on Craigslist. 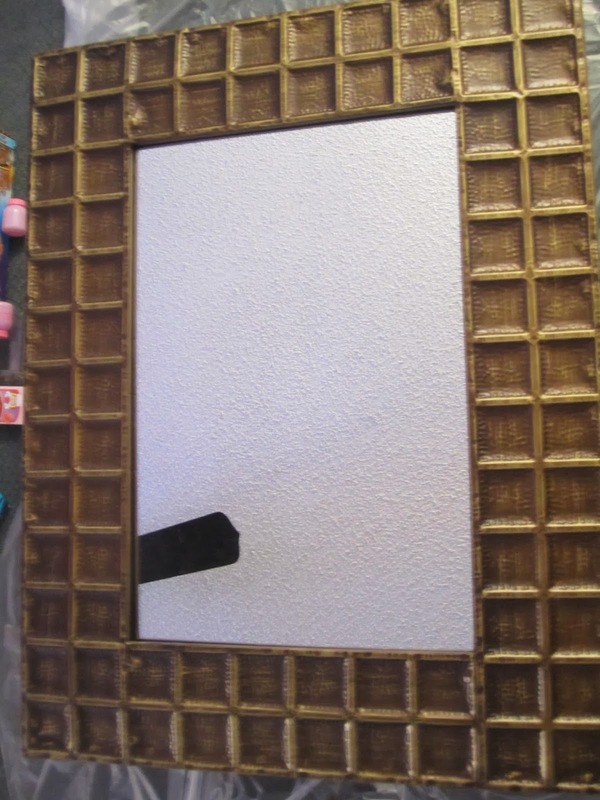 I knew I wanted an ornately framed mirror, which I would paint lavender. I found this for $15 and loved it instantly. It was brass, but I planned to paint over it. I hung it up and figured I would paint it later. I followed the same procedure as above: primed with oil based primer and then followed that with 2 coats of latex and some Polycrilic in gloss to preserve the paint. The lavender color is actually a paint sample that I found for $.50 at Home Depot in their "Oops" shelf! It is Blue Wisteria by Martha Stewart. It's the absolute *perfect* lavender - not too bright and not too pink. I'm sure the person returned the sample because it is not blue at all - it's decidedly lavender, and quite possibly the most perfect lavender I've seen. Because of all the bumps and intricate carvings, I used a foam craft brush to apply the lavender paint. And here is the finished product! Yay for the power of paint! Have a tremendous weekend! Starting Monday, I'm going to do weekly Ironman Lake Placid training recaps. The race is still over 6 months away, but the training has begun in earnest. It will be a weekly, Monday feature on the blog where I recap the prior week's training. I hope you enjoy it. 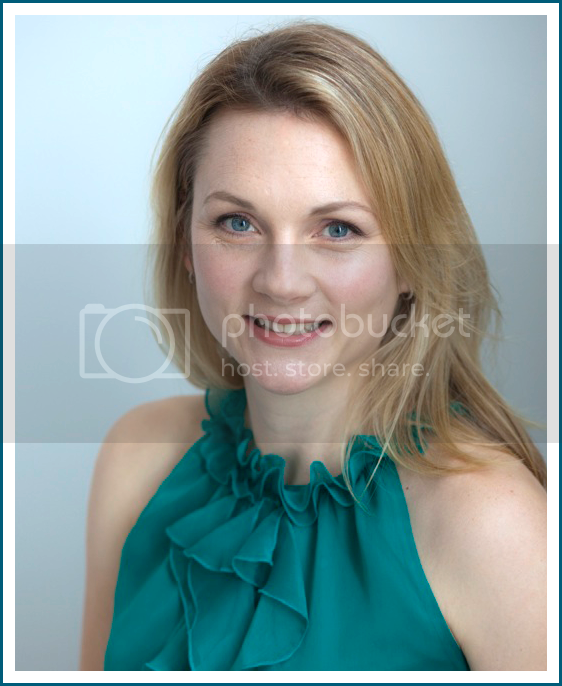 It is such a huge part of my life, so it's time to include it on the blog. Wheeeeeee!